The software uses an update function in order to keep the software up-to-date. In the menu bar, choose: "Help - Check for updates"
This will load the update manager. You must be logged in as an administrator in order to install updates. Not all of the downloaded files could be installed. You are not logged in as an administrator. Solution: Log in as administrator. You are running part of the program that is trying to upgrade. 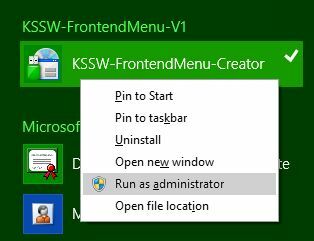 Solution: Close all of the software components associated with KSSW-FrontendMenu-Creator (except for the KSSW Front End Menu Creator). The software update requires a new file to be created on your computer. In this case Windows requires your approval for the update. From the context menu, select: Run as Administrator..